Thin pork chops make a simple skillet meal with fabulous flavor when they're paired with an easy Boursin cheese sauce. A little wine helps to flavor the sauce but substitute with chicken broth if you don't care to cook with wine. Sprinkle pork chops with salt and freshly ground black pepper and coat lightly with flour. Heat oil over medium heat in a large skillet; brown the pork chops for about 3 minutes on each side. Add chicken broth and red wine; bring to a boil. Reduce heat to medium-low and simmer, uncovered, for 5 minutes. Cover and simmer for 10 minutes longer. Add the Boursin cheese and pepper; cook, stirring constantly until the cheese has melted. 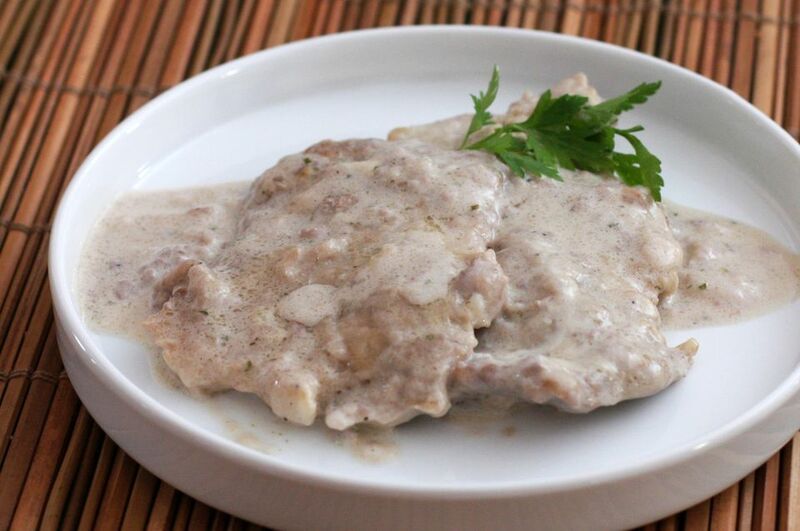 Serve chops with the cheese sauce. Serve the chops with mashed or baked potatoes and your favorite vegetables or a tossed salad for a delicious everyday family meal.